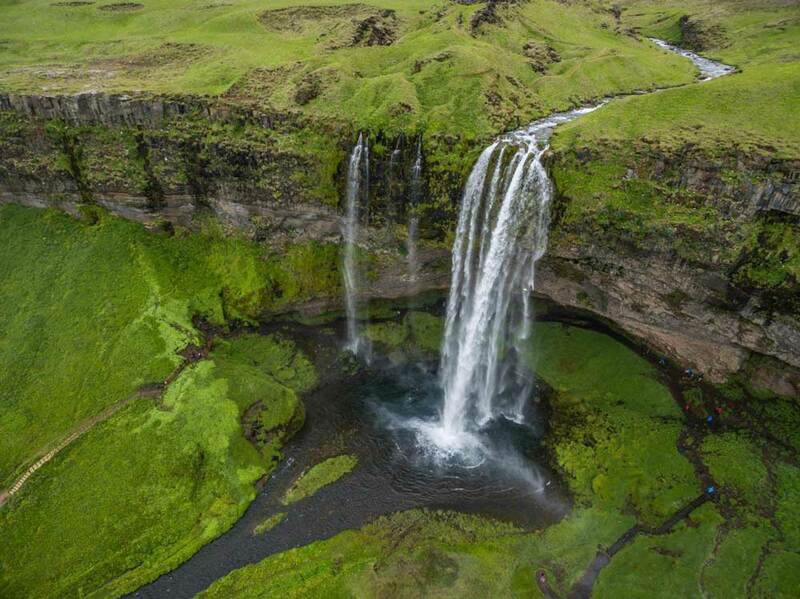 Seljalandsfoss waterfall is a supremely graceful waterfall located in the South Coast of Iceland. 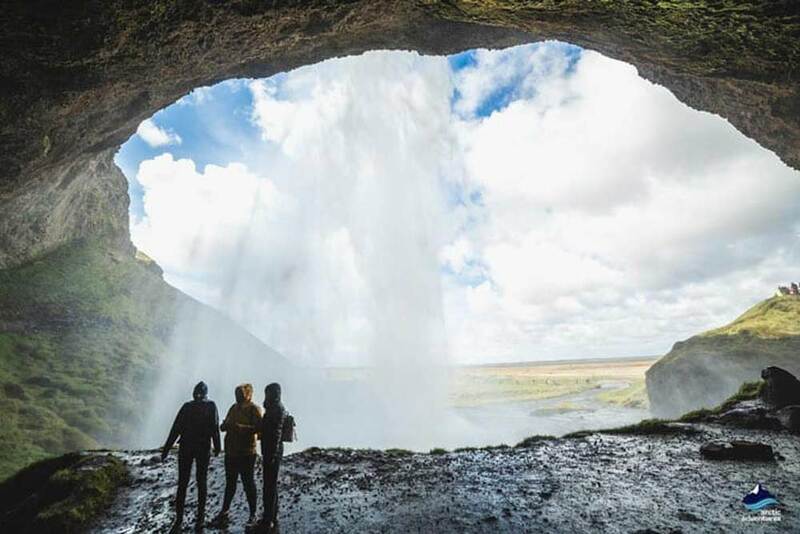 This spectacular natural wonder drops around 60 meters into the otherwise tranquil pool below and a hidden path leads you behind the waterfall so you can view the fall from a complete 360° angle. Seljalandsfoss waterfall will likely be one of the first things you hear about when Iceland is in question. 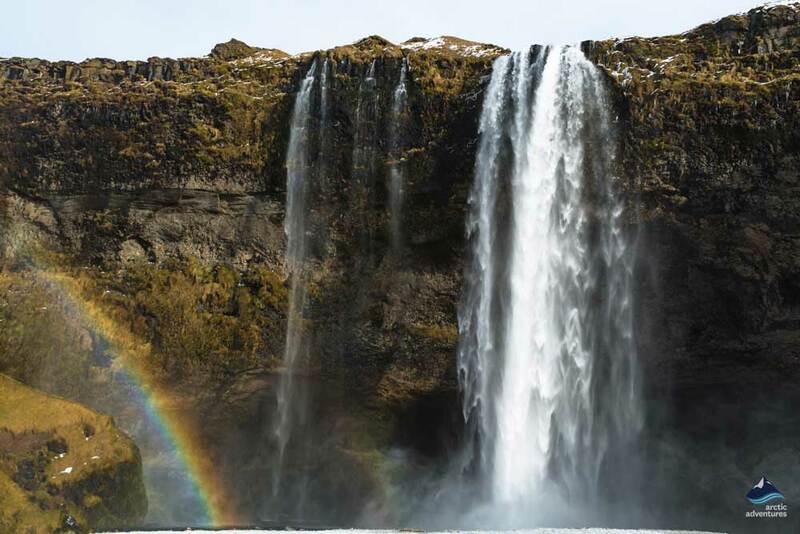 The waterfalls of Iceland have truly made a name for themselves all around the world but Seljalandsfoss waterfall stands at the top. 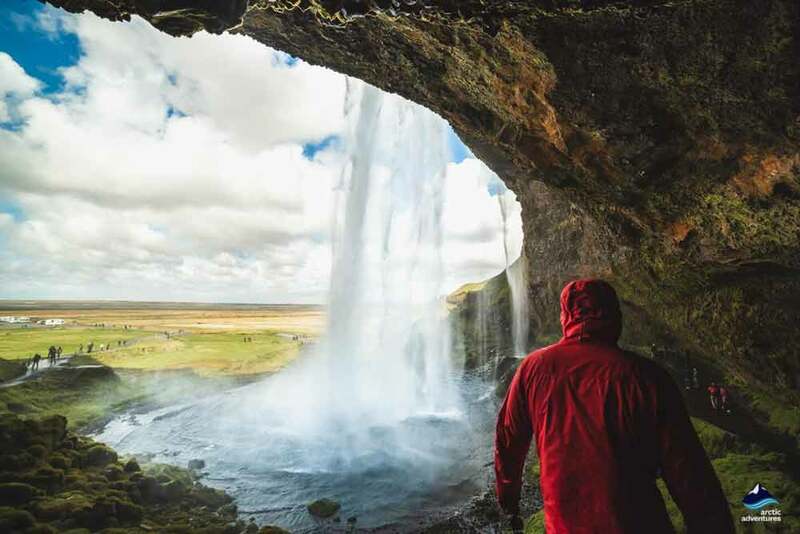 When visiting you should be prepared to get a little wet because Seljalandsfoss is one of the very rare waterfalls, anywhere in the world, where it is possible to walk behind the narrow, cascading falls. Following the pathway from the base of the cliff will take you behind the vigorously tumbling waterfall. We recommend you take your time and make the most of an opportunity to take some totally unique photographs. 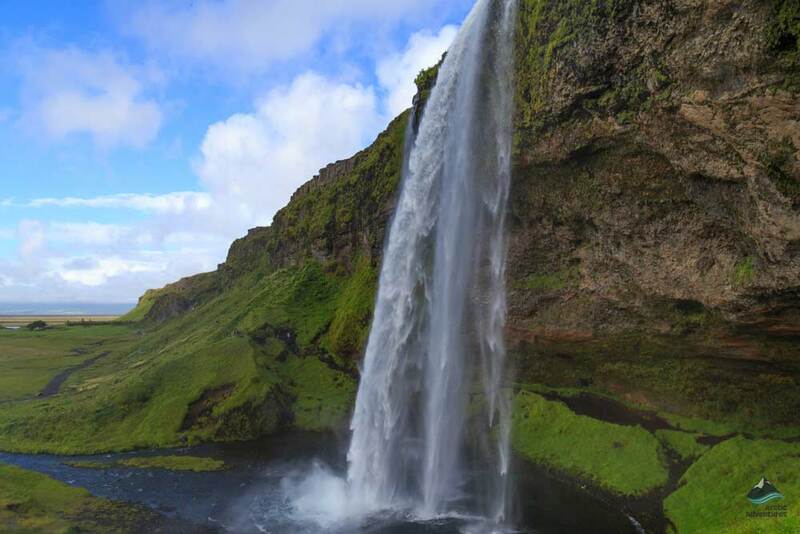 Seljalandsfoss is on the Seljalands River which flows all the way down from the famous stratovolcano, Eyjafjallajökull! 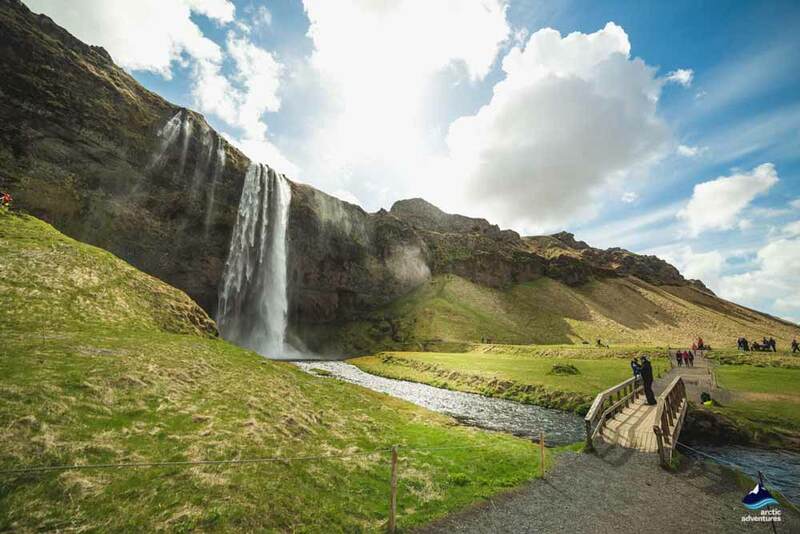 Seljalandsfoss has been one of Iceland’s most famous landmarks since travelers started visiting and is hard to miss as the waterfall is located right off the Ring Road one. It can easily be visited on a day tour out from Reykjavík and nearby you will find numerous other interesting attractions. 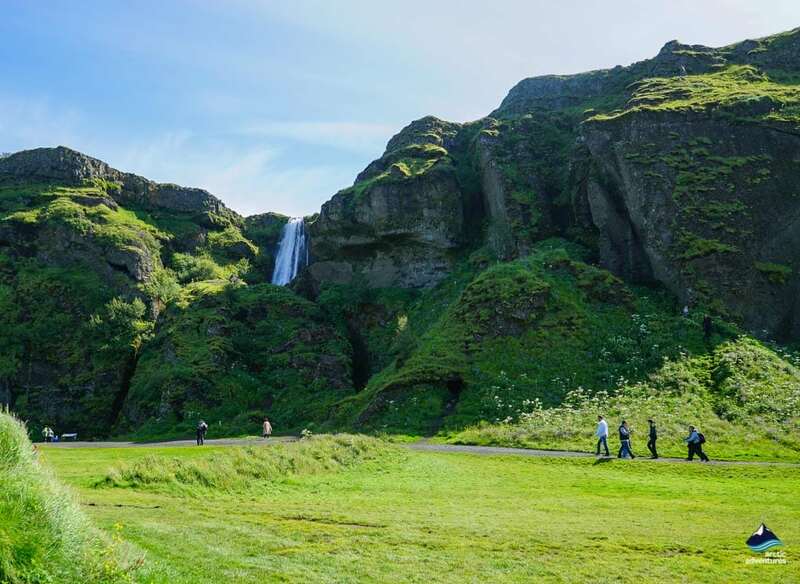 The road to Seljalandsfoss is the same that leads you to Þórsmörk, the Valley of Thor and the waterfall can be visited throughout the year. 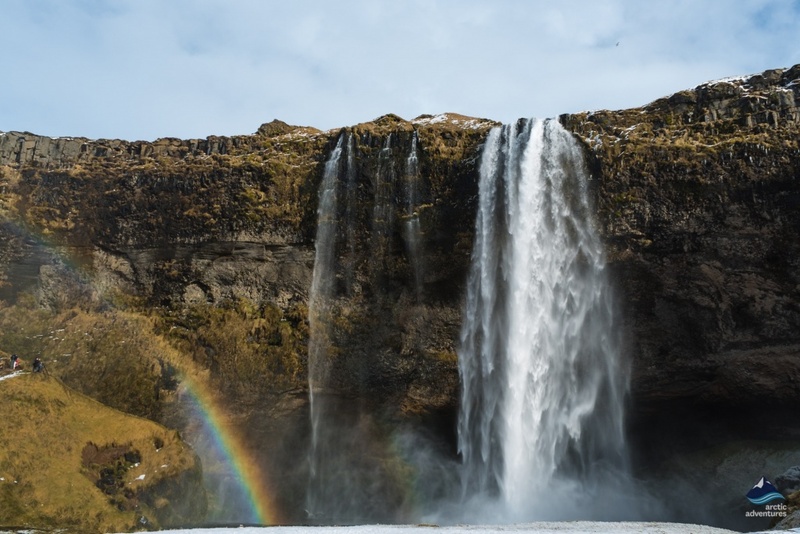 The water that flows through Seljalandsfoss is glacial water and originates in Eyjafjallajökull glacier that became famous in 2010 when the stratovolcano suddenly erupted causing all air traffic in Europe to completely shut down for about 5 days. 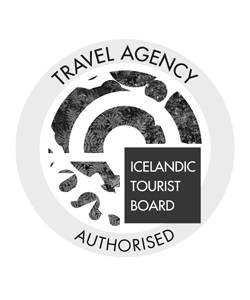 This eruption really put Iceland on the map as a travel destination and the glacier volcano and anything that goes with it as well. Eyjafjallajökull that rests above the waterfall and the Eyjafjöll mountains feed meltwater to the river Seljalandsá which then runs down the slopes before finally dropping vertically off the Seljalandsheiði heath creating the most stunning chute. 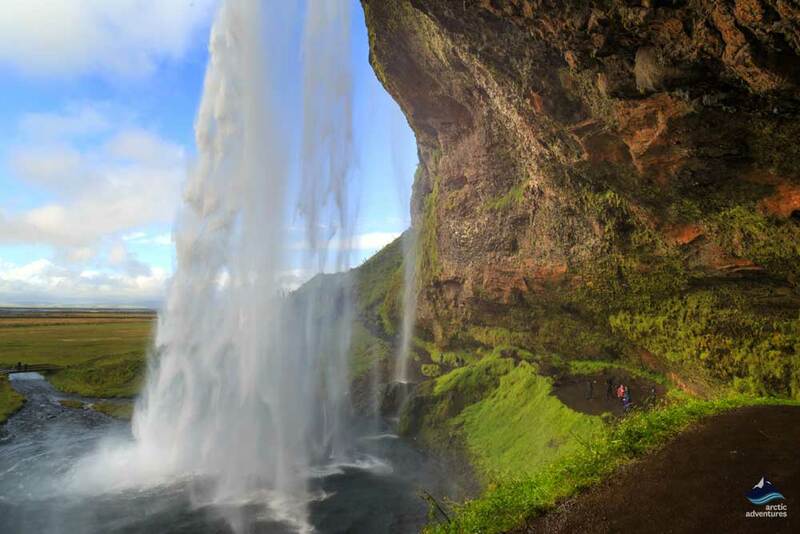 Seljalandsfoss waterfall is located on the South Coast, about 120 km (74,5 mi) from Reykjavík. 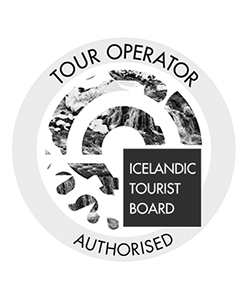 For those traveling from an easterly direction, the distances are 60 km (37 mi) from Vík and 29.2 km (18 mi) from Skógafoss waterfall. Driving from Reykjavík to Seljalandsfoss you are going to want to take the Road 1 that leads you through the towns Selfoss, Hella and Hvolsvöllur. After having passed Hvolsvöllur you continue East for about 18 minutes before seeing a sign which tells you where to turn to get on road 249 which takes you to Seljalandsfoss. 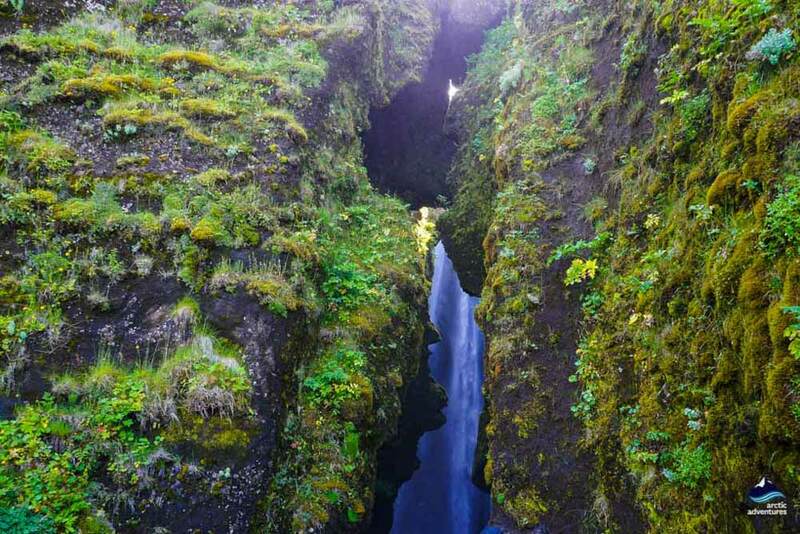 The road is the same as the one that leads you to Gljúfrabúi waterfall and later Þórsmörk valley. Driving from Vík/East to Seljalandsfoss you drive the Road 1 straight past Jökulsárlón Glacier Lagoon, through Kirkjubæjarklaustur and the town Vík. When you are at Vík you have about 50 minutes left before you reach Seljalandsfoss. Just continue straight on Road 1 until you see the sign to Þórsmerkurvegur, road number 249 leading you to Seljalandsfoss, Gljúfrabúi and eventually Þórsmörk Valley. During winter the paths can get quite slippery, do to this reason we encourage anyone visiting in wintertime to bring with them shoe spikes. Bring something rain gear if you are planning to walk behind the waterfall. Electronics, cameras or phones might get wet when walking behind the waterfall. Make sure to bring covers when walking behind the fall. 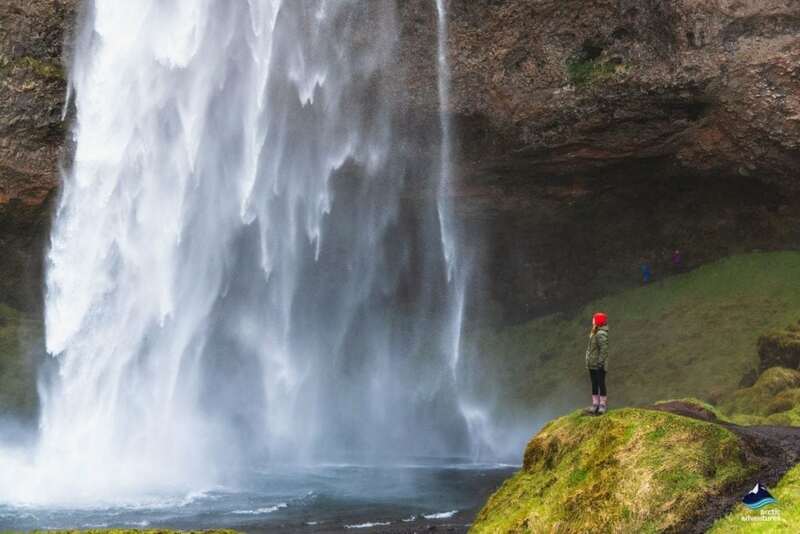 Don’t visit Seljalandsfoss without a stop at Gljúfrabúi waterfall, hidden behind a small cave entrance, located only a little further West about 200 meters. 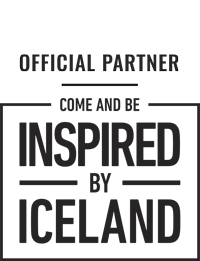 Those together make up a magical duo, not to be missed! Seljalandsfoss is a popular place so during the midnight sun you might want to consider visiting early or late to beat the crowds. You will need to pay for parking so keep that in mind, the parking ticket is valid for the whole day. 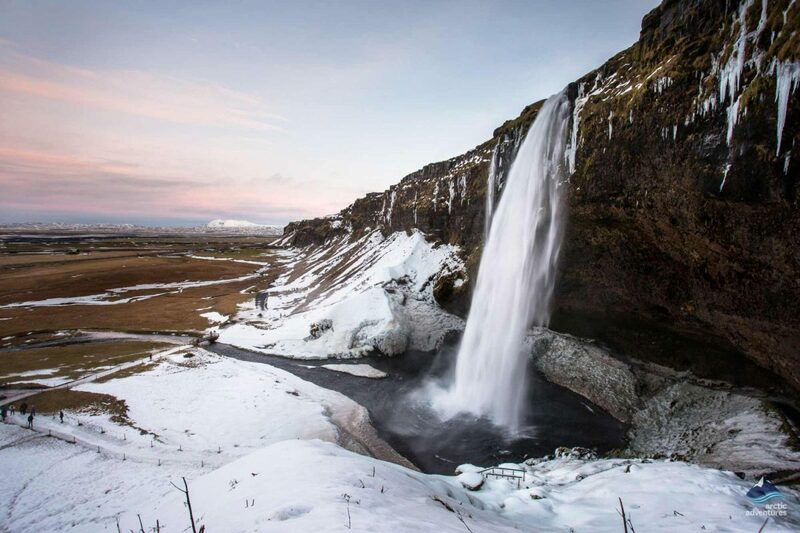 In winter the area around Seljalandsfoss looks nothing short of a winter wonderland. 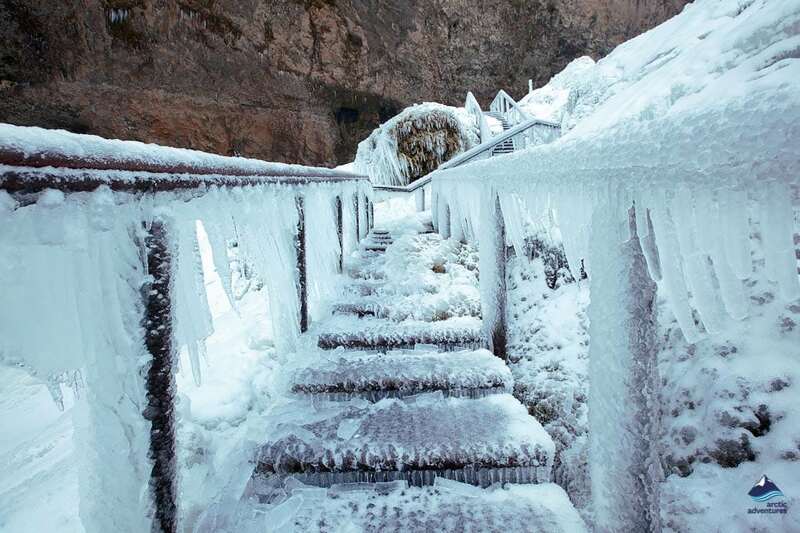 The icicles hang from the cliffs and the frozen ground around the falls is covered with snow and ice. The scenery looks amazing and the waterfall is photogenic, to say the least. But winter around Seljalandsfoss also has its faults, the icing on the paths and around can be hazardous and it is important to be on the lookout while exploring the area on foot. Wear good sturdy shoes, preferably with spikes, this is necessary for a safe visit! If the path behind the waterfall gets too slippery it will be closed. Please be respectful of the closing and don’t try to go past the fence, it is put up for your own safety! In winter the waterfall is lit up with two enormous light beams and the visual is spectacular. It is truly worth a drive past and could be the perfect add-on to a night of Northern Lights hunting. 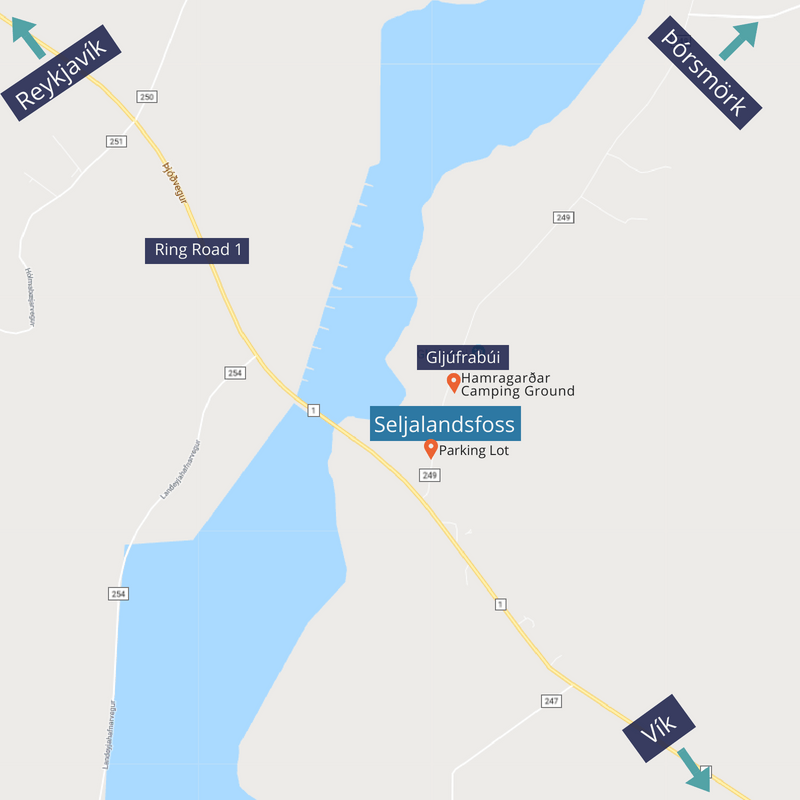 There are quite a few locations you can stay at near Seljalandsfoss but to cut the counting at some place we will narrow our choices down to about 30 km. GPS N63 37.240 W19 59.362. There are so many different ways to stay the night near Seljalandsfoss but during summertime, camping is an excellent choice of accommodation. 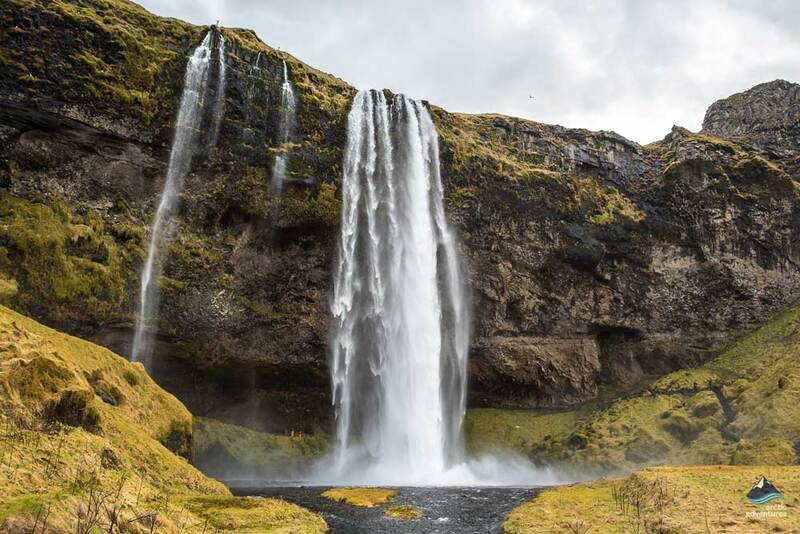 The camping ground is called Hamragarðar and is only about 2 minutes away from Seljalandsfoss itself, right in front of Gljúfrabúi waterfall. It is well equipped with stoves, counters for food preparations, dishwashing stations, tables, laundry rooms, bathrooms, showers, a small information center where you can buy some snacks. 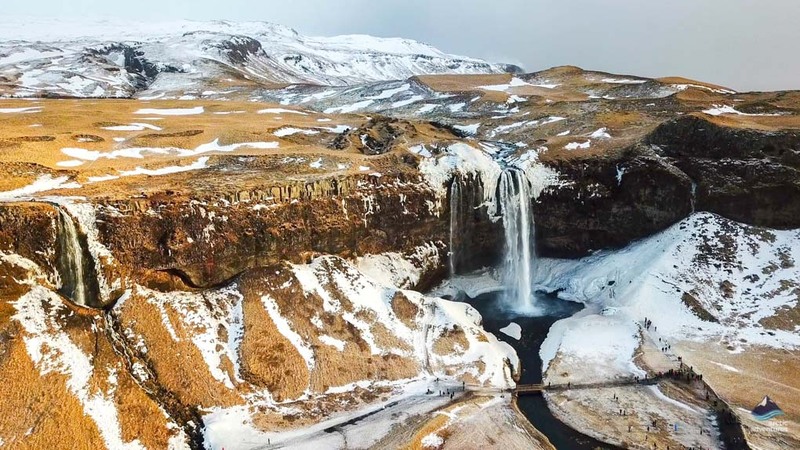 In the year 2017 parking fees were introduced at Seljalandsfoss as costs of maintaining the property were piling up with no source of income to pay for the repairments. Many don’t know this but Seljaland is actually the name of the farm which the waterfall’s land belongs to and the farmer lead the committee that made the final decision. Together the landowners and the local municipal authority now charge for the parking to raise money for maintenance of the facilities on site, walking paths, public restrooms etc. The fee is 700 ISK and the ticket is valid for the whole day. Seljalandsfoss has played a starring role in music videos and tv shows. One will not have to wonder why, as the waterfall’s setting and uniqueness shines out in any clip. Here are examples of filming at Seljalandsfoss. The Amazing Race 6 (2004) in the American TV series the first leg brought contestants from Chicago to Iceland where they memorably visited Seljalandsfoss, Vatnajokull, Jökulsárlón and the Blue Lagoon. Justin Bieber – I’ll Show You (2015) In the video Justin is seen standing on a small ledge in front of the waterfall that gushes down from the high cliff into a pool of water. Gerua – Shah Rukh Khan (2015) In the video the two main characters are seen dancing and embracing behind the waterfall. 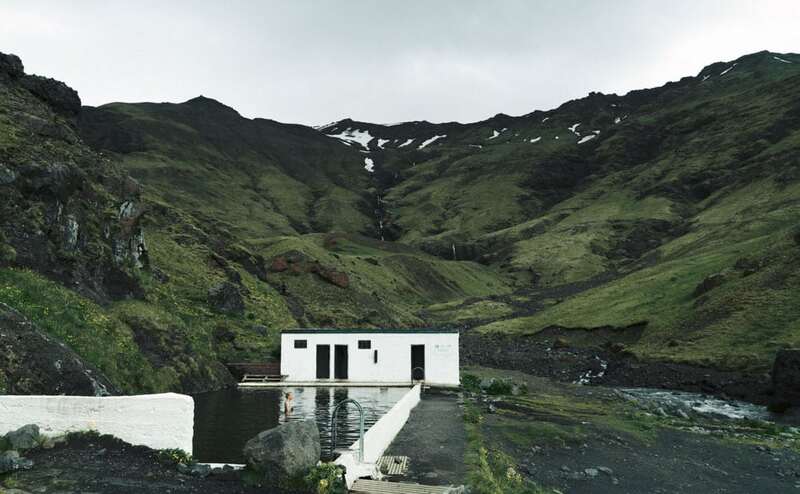 The old Seljavallalaug swimming pool is located in a remote setting in Midlands on the South Coast. Its story dates back to the year 1922 when the pool was originally built in the custom of that time with rock and turf. It took two days to build and was after that used to teach the locals how to swim. About 25 men took part in making the pool which was nine meters long and a little over four meters wide. The students camped in tents near the pool during the course of the swimming education. The swimming pool was soon a bit hit and later the pool was improved with concrete. At that time the pool was the biggest swimming pool in Iceland but through the years other more modern swimming pools were built and it was almost forgotten until the year 1998 when it was restored and once again was in use. The pool is truly unique and its location makes for a memorable visit. Fun Fact: In 2010, Eyafjallajökull’s eruption filled Seljavallalaug up with ash and visitors could barely stay in the pool as it was almost full and they would get cold very quickly. 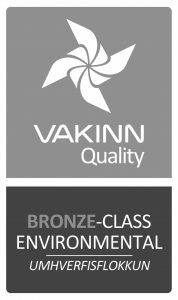 The pool has since then been cleaned and now you can visit without any volcanic ash problems. Still the fact that the pool is located this close to the volcano makes it even more special. Drive from Reykavík the Road 1 as you were going to Seljalandsfoss but pass the turn for the falls and continue onwards East until you see a sign pointing you to road number 242. Then you make a turn towards land and drive until you hit the parking lot. There you need start walking to the pool which should take about 20 minutes but the scenery is gorgeous with plenty of opportunities to stop and admire the location. 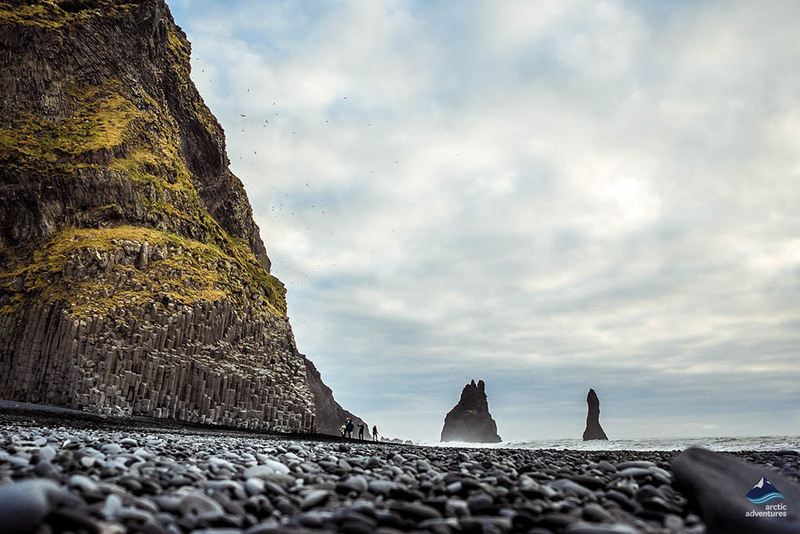 This two-day tour along the beautiful south coast of Iceland offers you the ultimate highlights in a small and friendly group.